In some ways Coach’s progression from its beautiful, durable, everlasting classic bags to the monogram chic bags reflects the direction of the perfume industry. Both things were once lovingly crafted objects made with fine materials have been reduced to faster, larger, and cheaper. 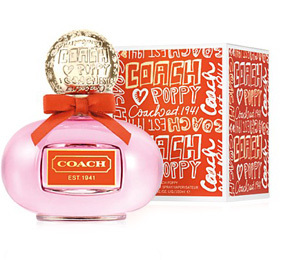 So I found it rather funny to be reviewing Poppy, the fragrance from Coach and named in similarity to Coach’s youthful line of bags that feature vibrant colors and–of course–the Coach monogram. In Bottle: Smells like a dime-a-dozen candy floral fragrance. Not bad, not too exciting. It hits me right away with the mandarin note and wastes no time digging into the marshmallow. Applied: Mandarin up top followed quickly by the clean, crisp tones of cucumber. Freesia and the other florals are present in the first minute of the opening and the fragrance evolves more into its floral candy-coated personality near the mid-stage with that marshmallow vanilla thing they did. Poppy settles into its floral candy self for the majority of the rest of the fragrance as the wood notes make themselves known near the very end and in a very faint way. Extra: I used to be something of a Coach fan and was ecstatic to receive a Coach Wilson bag from the 90s. These days, Coach’s bags don’t interest me too much. I don’t see the appeal of the Poppy line at all and I don’t see the appeal of the Poppy fragrance either, unfortunately. It’s probably another one of those instances where my tastes clash with the company’s aim. But Poppy is like a generic perfume for which I can name several alternatives. If you do need an actual recommendation, the perfume community likens this to Britney Spears’ Fantasy. I can see the connection between the two, especially when the fragrance hits its mid-stage. If you want a personal alternative recommendation, try smelling Bath and Body Works’ Be Enchanted that has a similar progression from refreshing to sweet. Design: I do like the bottle and feel that scribbly the monogramed look of the Poppy line works rather well for this fragrance and what it’s trying to be. It’s cute and functional and simple. It’s clearly marketed towards girliness and people who like that sort of thing. So in terms of looks, Poppy’s got it down. Notes: Mandarin, cucumber, freesia, jasmine, gardenia, water lily, rose, sugar, marshmallow, sandalwood, vanilla, cedar. A big disappointment in terms of uniqueness but Poppy, like pretty much everything else similar to it works well if you’re into the sweet and flowery fragrances. You can, however, get more affordable fragrances that have a similar aim for the amount that Poppy costs if your chief concern was how it smells. Reviewed in This Post: Poppy, 2011, Eau de Parfum. This entry was posted in coach, floral, fresh, Reviews By House, sweet and tagged cedar, cucumber, freesia, gardenia, jasmine, mandarin, marshmallow, rose, sandalwood, sugar, vanilla, water lily. Bookmark the permalink.